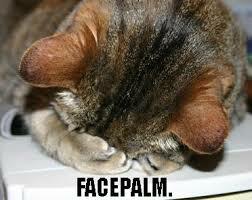 Say I have to go to your website now, am I going to see an opt-in form and sign up your email list within 5 seconds? If your answer is no, you are not alone. You see, I went through about 118 author profiles who are on The Self-Publisher’s Showcase another day. 21 of them don’t have a website at all or their websites are not working! 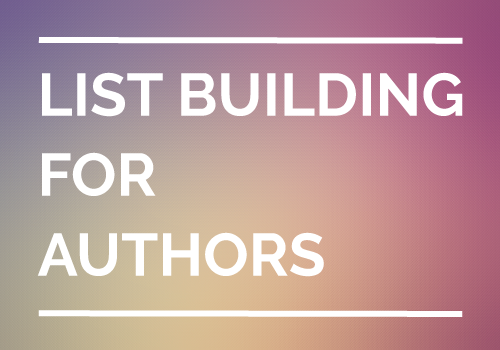 For the 97 authors who do have their own author platforms, only 51 are building email lists with an opt-in form. Guess what? The majority of them took me more than 10 seconds to actually FIND their opt-in forms. Their opt-in forms just aren’t obvious. Why Aren’t Authors Getting As Many Subscribers As They Want? You have probably heard enough of that. If building a list is proven to be important in selling more books, why isn’t every author having one and getting as many subscribers as they deserved already? They don’t know how to build an email list. They don’t know how to build an email list correctly. For the first problem, it’s easy to solve. Sign up an email autoresponder. I use MailChimp. But many other similar services also come with free or trial account. Next, create your email list, generate your opt-in form, then copy-and-paste the code onto your website. Viola! You are ready to build your own email list. If you get stuck, there are plenty of tutorials help you to get unstuck. For the second problem, let me explain. While doing my research about author websites, I literally clocked how long it took me to locate and sign up an opt-in form from the moment I landed on their sites. For websites that aren’t using what I call The Obvious Opt-in Panel, which I will explain in a minute, it took me an average of 16 seconds to subscribe. Why is this a huge problem? The hard truth about the human behaviours today is that, we have learnt to be more careful in choosing what we want to see when it comes to the Internet. We filter away information that we are not interested in or does not resonate with us – right away. Based on a research done by Microsoft study, the average attention span of humans has found to deteriorate from 12 (Year 2000) to 8 seconds (Year 2013). Congratulations! You now have a shorter attention span than a Goldfish, thanks to new technologies like smartphones. That means – when someone lands on your website randomly, you have only an incredibly short time to win or lose him over. Assuming you don’t optimise your website properly and your visitors have to sort through every corner to look for that tiny sign-up form, and they don’t find any appealing reason to join your mailing list – they are out and will move on to the next thing quickly. The moment they close your website, you lose them forever. This is no wonder why so many authors gave up on building an email list even after getting the opt-in form installed! Perhaps that describes you too? The good news is, you don’t have to build your list like that. And you shouldn’t. I am going to show you how you are able to get more subscribers by making a small tweak on your website with a feature box opt-in, or what I like to call the Obvious Opt-in Panel. To make this easy to understand, have you seen our demo author website before? If yes, you’ll know that we have a large and obvious opt-in panel right at the top of our homepage. This panel is great for three reasons. 1. It is OBVIOUS, obviously. 🙂 Your web visitors don’t have to “search” for your opt-in form. It’s right there, big and clear. With the right kind of design you capture their attention quickly and make it so easy for them to sign up. 2. It tells what you stand for and offer right away. You can’t blame your visitors for not knowing what you do. It’s your responsibility to get that message across. With the right copy and when it resonates, people give you their emails because they trust you may be the right person to help and have their best interest in mind. 3. It builds your list with the right audience. You only want the right people to sign up your list rather than everyone else. With the right offer you filter away those who care less and recruit only those who show interest about your work and give you permission to interact more. How To Apply The Obvious Opt-in Panel On Your Website? So, does the Obvious Opt-in Panel work? You bet! 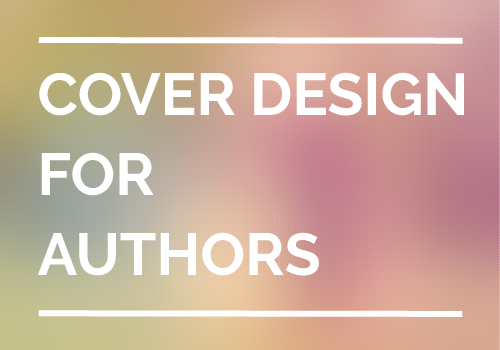 This is a proven method of what many other best-selling authors have already been doing on their websites! In fact, I will walk you through the opt-in panels of two best-selling authors (also my favourite authors) and how you can learn to do the same below. First of all, both have made their opt-in box obvious, by featuring it right at the top and the first thing you see upon landing on their websites. Next, let’s get down to the details of what to include in the panels and why. If Michael’s opt-in panel doesn’t catch your attention, I don’t know what will. (1) Fantastic author photo. People want to talk to real people. By having a real face it implies you are genuine and not just pretending. (2) Powerful headline. A precise copy explains what Michael Hyatt stands for and how he is able to help his audience succeed in business and life. (3) Strong social proof. How credible are you? Why should people trust you before anything? This is where third party endorsement and social proof back up your credential. (4) Tailored offer. If you aren’t someone who is busy with life and business and still want to achieve more, you will probably walk away from this; but if you are, chances are you will sign up to learn what is the “4 proven strategies” he is going to share! Furthermore, you want to give a clear-cut instruction when it comes to making a request. 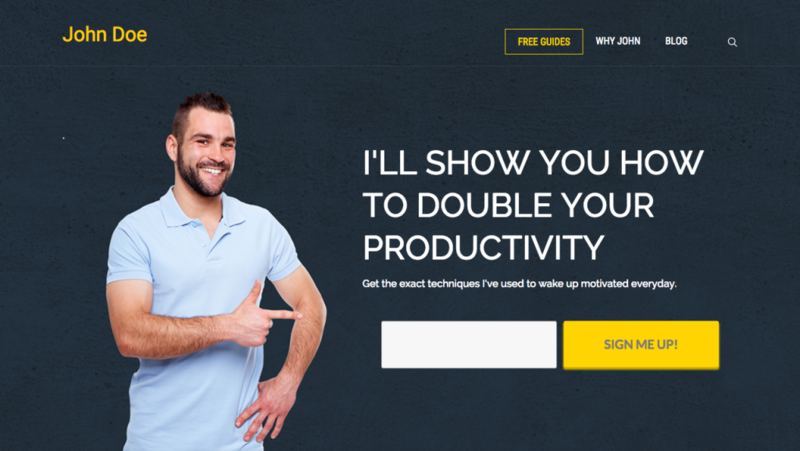 Michael has made it clear of what you will get (free eBook: shave 10 hours off your workweek) and how to get it (enter your name and email address, get it now). Another great opt-in panel example comes from Ramit Sethi. (1) Strategic author photo. I don’t want to get too technical, but you might have noticed Ramit is gazing towards somewhere – his opt-in form. Why? Because research has proven that people will look where the person in the photo is looking. By using the human photo strategically, you are able to direct your visitors’ gazes to where you want them to go. (2) Powerful headline. A good “question headlines” draws your prospects into answering it when used properly. Do you want to live a Rich Life? Who doesn’t? Are you ready? You bet! Well, sign up below and I will teach you how. See that? (3) Promising offer. If someone is interested in changing their life to becoming more wealthy, and by following the “question headline” above, he is very likely to sign up for something that promised to do just that. 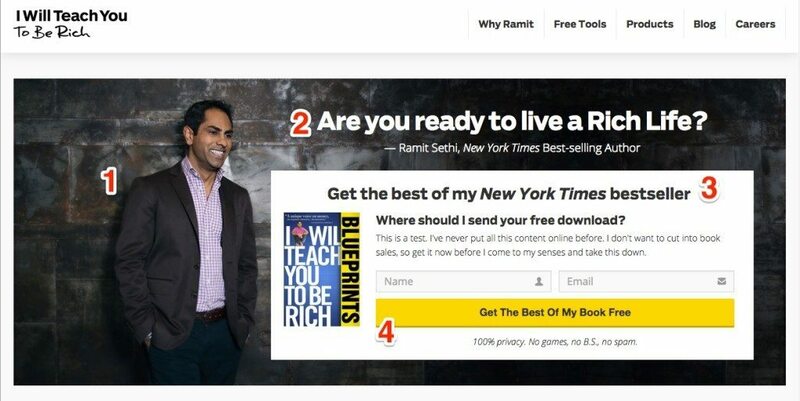 In this case, it is the best content of his Ramit’s NYT bestseller book, I Will Teach You To Be Rich. (4) Strong call to action (CTA). Ramit has made it straight to the point (Where should I send you? ), explained why (This is a test.) and created some kind of urgency to prompt you taking action now (Get it now before I take this down). Not to forget, that big yellow sign-up button! 1. Make your opt-in form obvious. Don’t let your web visitors search for your sign up form, because they won’t! Show them where it is, tell them what to do. 2. Make your positioning clear. Don’t be vague about who you serve, because your audience need to know your existence and what you stand for before deciding if they should trust you. 3. Make your offer compelling and targeted. Don’t be afraid to give away something, because the more value and specific you show in your offer, the better it helps you grow a targeted email list. The best part? Having the Obvious Opt-in Panel is going to do all three things in one place for you at the same time. 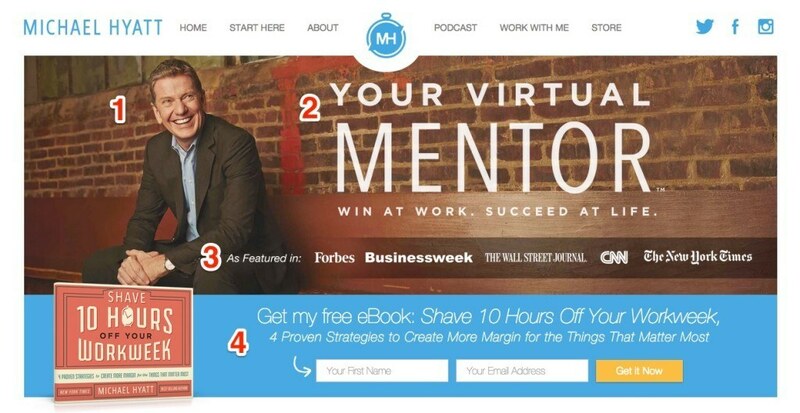 It’s one of the best tweaks I can vouch for growing your email list today. Are you ready to have The Obvious Opt-in Panel on your website? If yes, I am excited to know how it will help you and your business. Or if you are already having one, do share with me how it has helped grow your list in the comment below.